Spoiler alert: we did complete successfully! Out of 69 riders to start only 39 completed. Khaleesi and I placed 21 and had a ride time of 9hours and 24 minutes. Including vet holds we were on the trail almost 11 1/2 hours. We were basically mid-pack of those who finished and only had 30 minutes to spare. This means almost half of the riders who finished came in the last 30 minutes allowed in the 12 hours given to finish. I am convinced looking back that the only way we were successful in our first attempt during a hard day at the Beast of the East was a million small things that went right either by plan, preparation or just plain luck. #1- get the best farrier. Period. If I had to choose one thing that probably had the biggest impact on finishing this ride it is my farrier. If I could afford it I would give him a raise. Actually I could afford it if I walked the trail the next day with a pack mule to pick up all the random hoof boots and used twisted horseshoes (if they were worth anything). If the hoof boots weren’t so mangled and chewed up I could sell them on hoof boot exchange. I am not anti hoof boot by the way, whatever works for you is good but only if it WORKS. 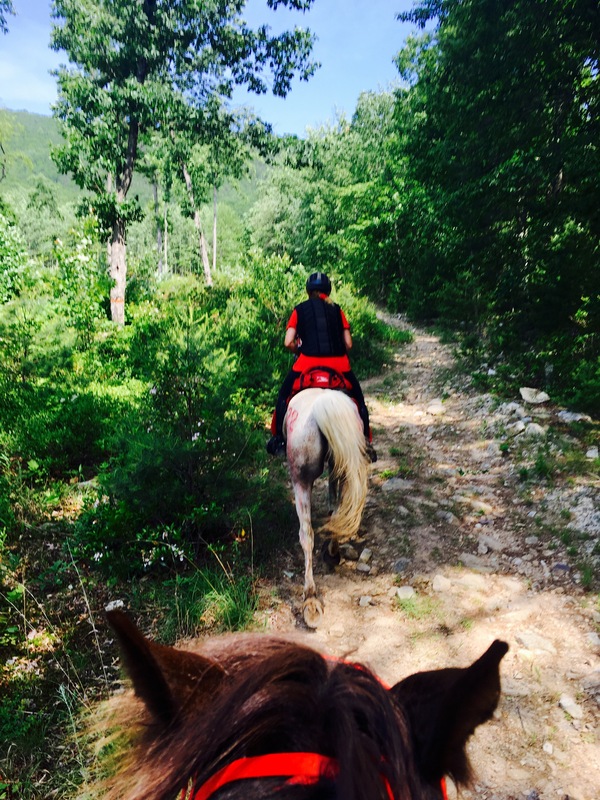 There were many moments in the 9+ hours on trails that I thought it was amazing that any horse came through this ride sound. 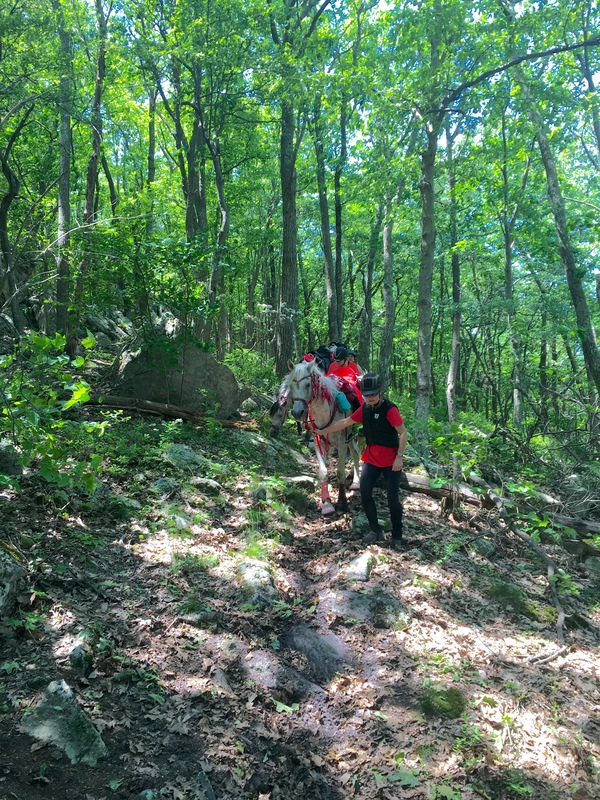 I was giving the odds pretty high that I would be taken down to a stone bruise or mystery lameness as we scrambled along the loose large rocks heading downhill about 6.5 mph picking up speed whenever we were safely (isn’t that a relative term) able. But this point doesn’t end with the obvious catastrophic loss of a shoe on the ridge that can end your day in lameness and failure. It’s not just about how he shapes the shoes exactly to custom fit each hoof and then sets and nails them to not come off until he pulls them off… my farrier is responsible for how my horse moves on ride day and every training ride leading up to it. He has to understand her movement and her balance and all the angles and science involved including things you can’t see with the naked eye (structure inside the hoof and leg). How he shapes her foot based on her unique body structure and how long her “toe” is, how high her “heel”is all determine how efficient she can move like having the best and most comfortable running shoes for a marathon. It affects if she can trot out at a good speed all day or if she gets more tired and worn out from the extra effort involved in carrying herself (and me) on feet that are not quite angled right. To top it off you haven’t a moment to waste on this ride and if you do lose a shoe it takes up precious time having the ride farrier get your spare tire on. My farrier sends me to each ride with our last shoes already custom shaped to each hoof. At least if we do lose a shoe we are ready with one ready to go and it will match the one lost. I do not underestimate this component for one second. All the time I invest in slowing down my communication to train her mind often with more priority than her body has served us well. This is a fundamental bedrock that often doesn’t ‘feel’ as important when I’m doing it as the ride miles but it might be more so. 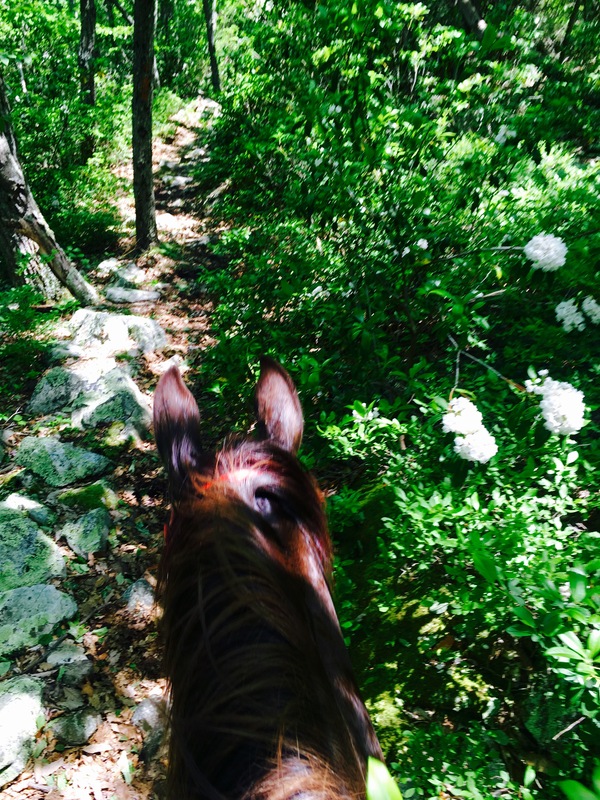 Many think that any time spent with your horse builds a relationship but this is not true. In fact spending time doing counterproductive things does the opposite and it takes knowledge and experience to know the difference with each horse – it’s not a motorcycle and it’s not a dog- in fact it’s not a human either. Your horse has a unique language and working from the ground up (literally) is key. I am glad for all the help I’ve gotten to learn this from people who do understand. I see riders who are ok with- or even like and prefer- a horse that just wants to run. Saddle up the dragon and get someone to hold him while they climb on… Then hold on… Conversations with people asking about bits that will give them enough control to feel safer and who talk about blisters on their hands from trying to hold their horse from running away down the trail. What a fast horse. My horse eats up the trail. I hear instead: I don’t truly have connection to my horse’s mind and am not the leader as soon as other horses are around. Of course a whole lot of riders in this sport, especially successful ones, have a close partnership with their horse and are true leaders. They have finesse and are not dragging their horse around (or being drug) they do it without force and anger and those are the people I notice and watch. We aren’t perfect. Our partnership is on a good start but it takes time. We will work on this until we die. 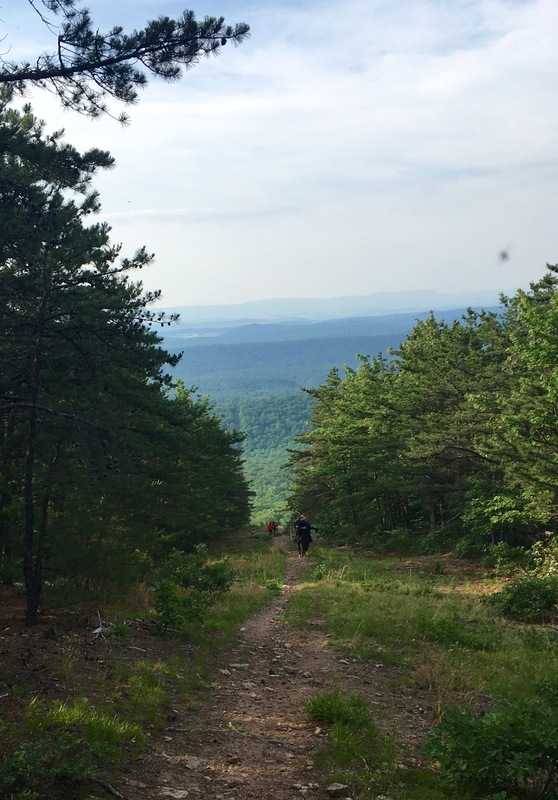 I am lucky- this ride is close to home and I don’t have to go far to find similar terrain but the OD is famous for two things: mountain climbs and rocks. 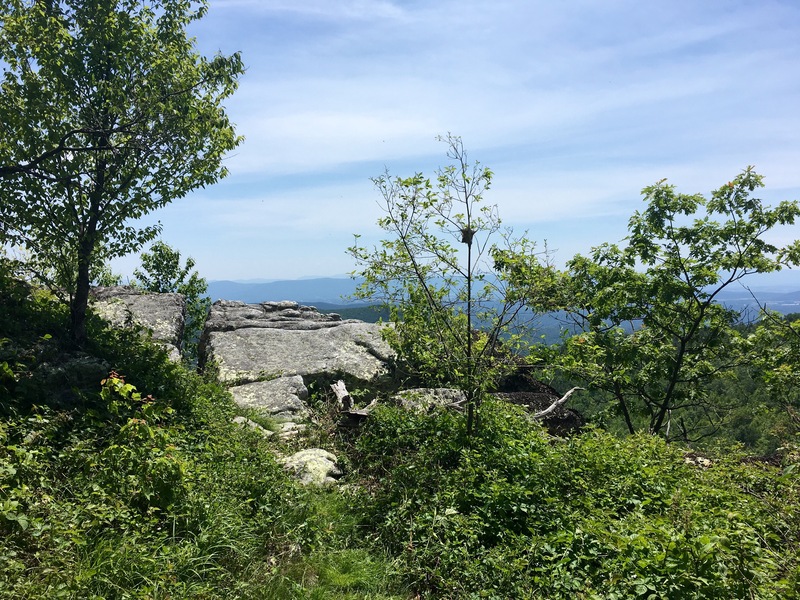 I took some time after we rested up from Biltmore to climb some of the steepest mountain trails I had and did it in the hottest part of the day as well. 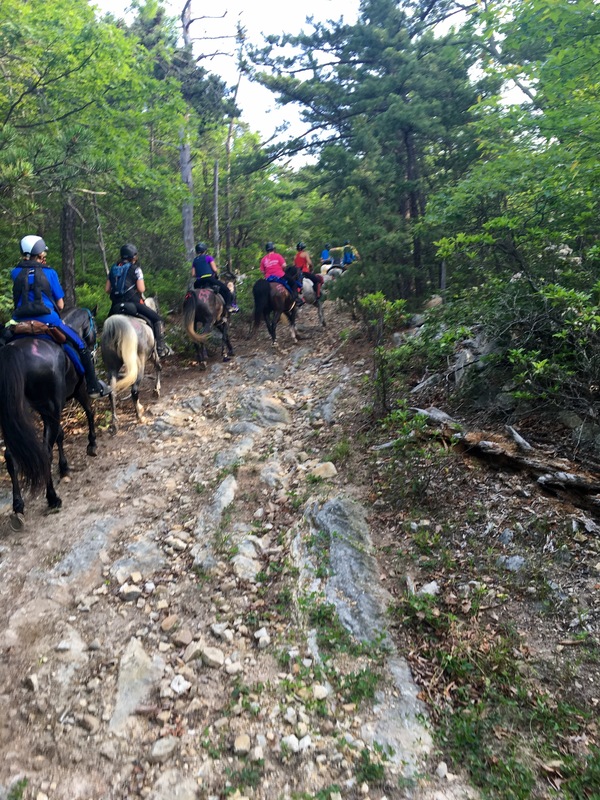 We often have to scramble along rocky trails though it’s hard to find riding as rough for as long as the OD dishes out- in general we try to avoid that because it isn’t really that fun! I also conditioned myself. I’ve been in the gym and doing strength training to become as fit as I can be. 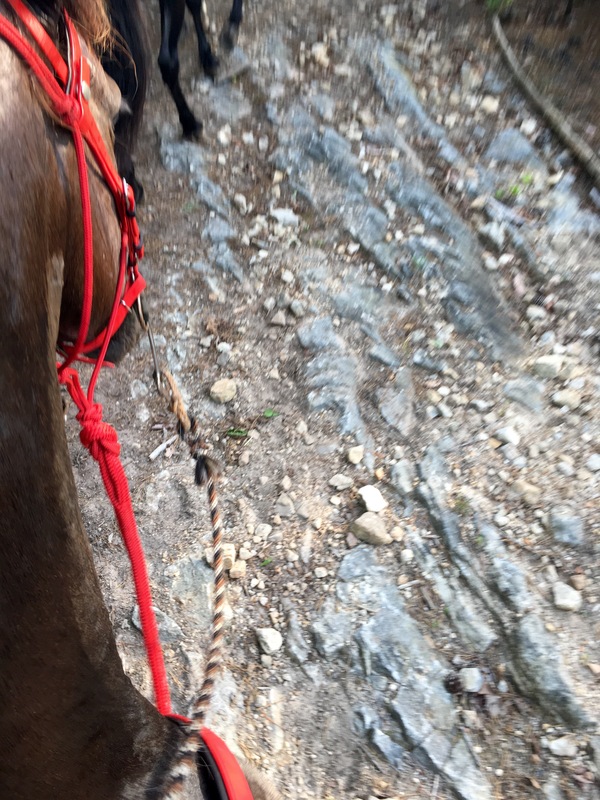 I need to float above my horse gracefully to make it easy on her, but the worst climb is two miles straight up the mountain and since we cannot go any faster than a walk I got off to save her energy and hoofed it myself leading her by hand. #4 chose your mentors and crew wisely. I am beginning to see a wide variety in style and priorities in the endurance community. I am grateful for the group of mentors and crew help I’ve found and that they work well with my goals and values. This weekend I don’t believe we had equine deaths but it is not uncommon to see this for various reasons. This sport pushes humans and horses to the edges of what they are capable of and it can be easy to lose sight of what is really at stake. Your horses life, well being, future career and your own safety. Looking at a mentor’s rider record can be helpful (do they end up pulled more than complete? are they often in the top 5 and have 4 or 5 horses listed in as many years? are they solid completion riders with one horse for many miles?) but then it’s helpful to see them with their horse and hear what others have noticed? what do the vets think? (they know it from the horse’s perspective!). My farrier who I admire recommended I seek out Lynne and I’ve never regretted asking for her help. 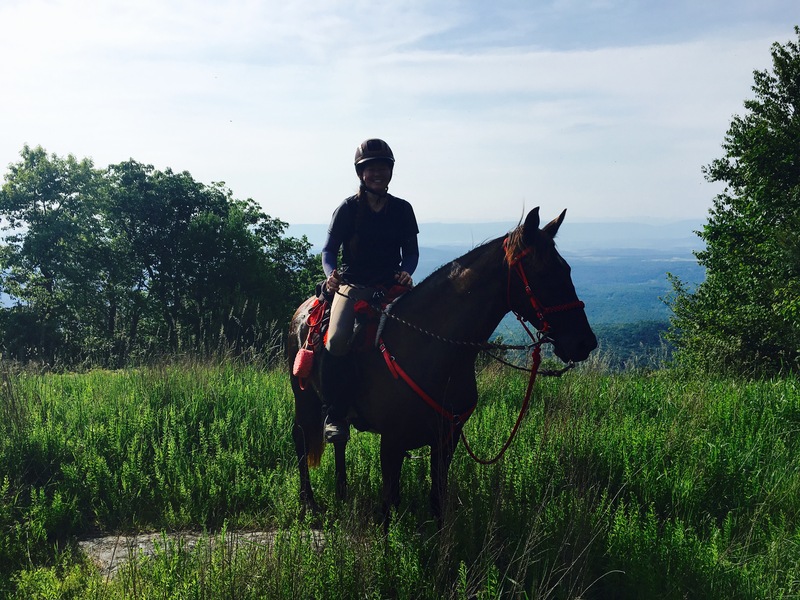 She is a smart, solid, conservative and experienced rider who often finishes in the top 10. I don’t hear her say how fast her horse is but instead she talks about how well he is doing. Big difference. Lynne did not ride the 100 this weekend on a horse that has been in the top 5 at every ride this season because the horse just “wasn’t himself” earlier in the week. 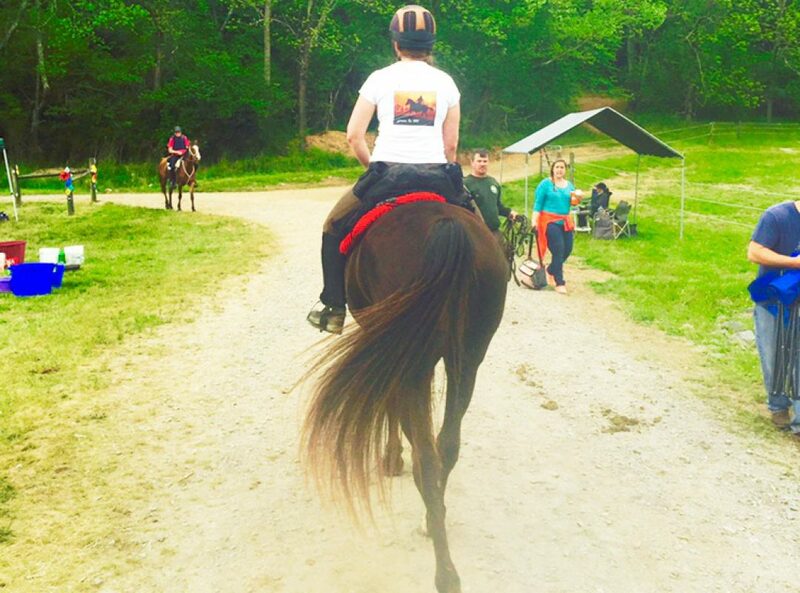 She put her horse ahead of her goals because it is a tough ride to start with any doubt. I admire her for that. She volunteered her time instead. Double admire her for that. Who you get advice and input from makes a big difference in the direction you will be headed. Choose wisely and if you see something that doesn’t work for you seek out other input. In previous rides work precluded me from arriving more than the day before. This year because volunteers were desperately needed I decided to go on Thursday afternoon so I could have time to volunteer on Friday for vet-in. This ended up being a more important decision than the thought I put into it. First, even coming two days before the event I ended up with one of only about 10 spots left on the creek side against the tree line. This means shade until almost noon and it’s just a little cooler all the time by the creek. Anyone arriving Friday- even early would be across from us in the direct sun field. 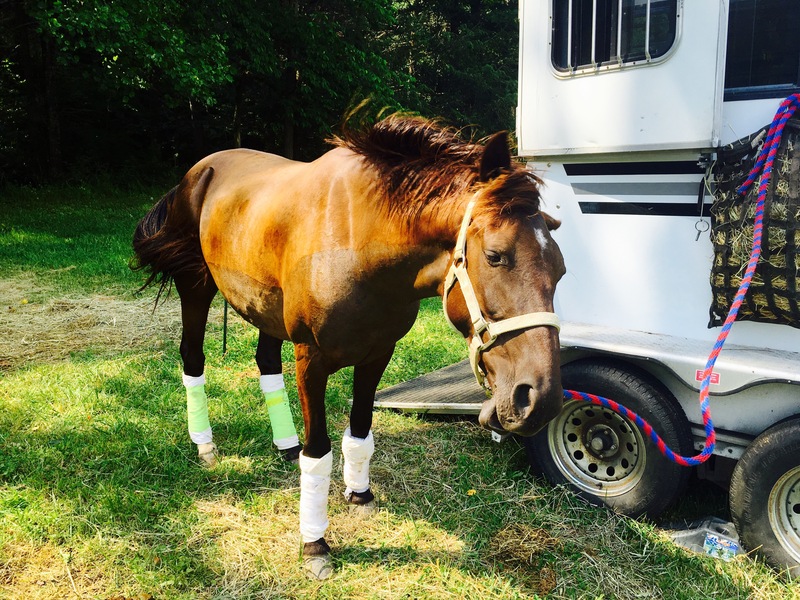 Second, research shows that even a brief trailer ride (a couple hours) dehydrates a horse significantly. 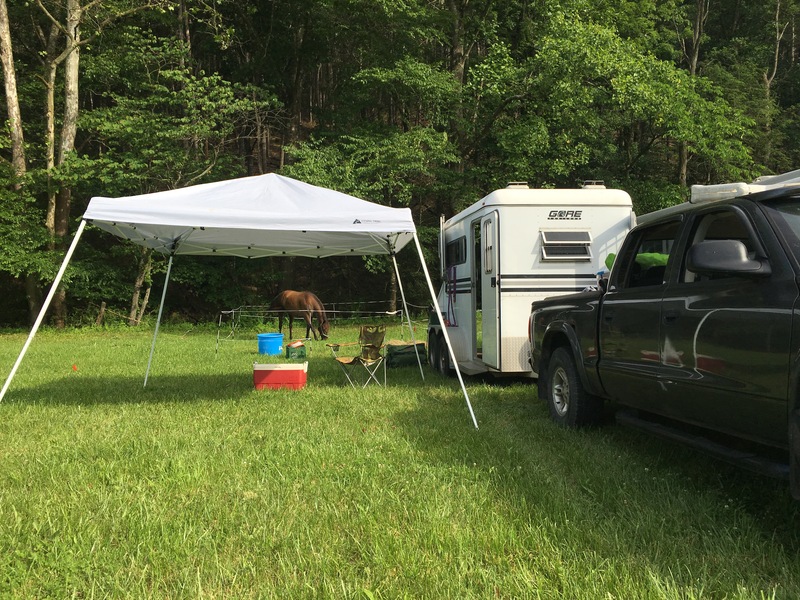 Because of the heat over this weekend getting into camp an extra day gave her time to drink and eat and not begin the ride slightly dehydrated. 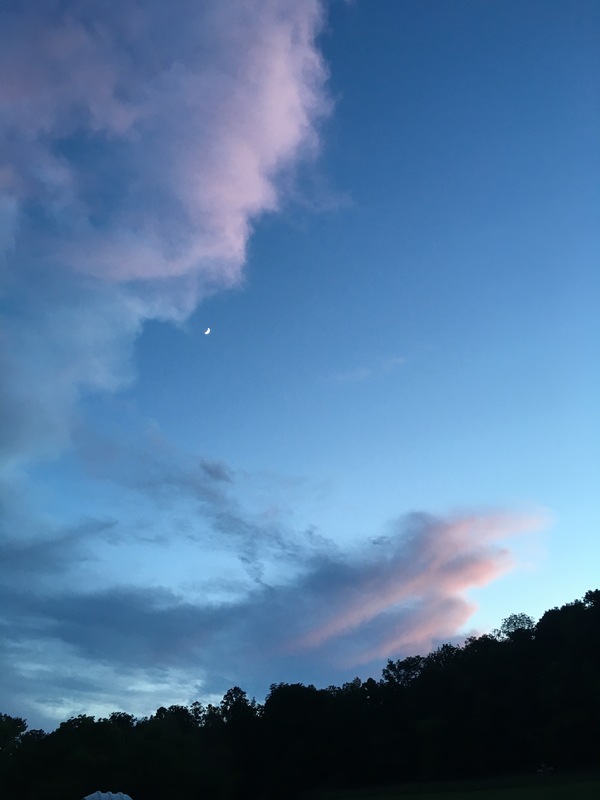 Third, I was not hurried at all… in fact on Thursday evening I even had some downtime. That helps my mental state in a variety of ways. #6 attend the ride meeting. I sometimes hear people skip the ride meeting because they’ve ridden X years here and they heard the trail is the same…. You never know what useful information or a marking change you might learn about- or trail tips including where they couldn’t get water to and where they could. What is available at the “no crew” vet check? The 45 minutes spent hearing things over you already know is not wasted if understanding a ribbon change or new issue with the trail helps you ride smarter. Ride smart. Pay attention. I ranked ahead of more than a few people who “should” have finished ahead of me but they added an extra 2-5 miles due to an accidental detour. Ride your own ride (so cliché in our sport but always true). I rode with many people for a while but I will not commit to “buddy” with anyone anymore. 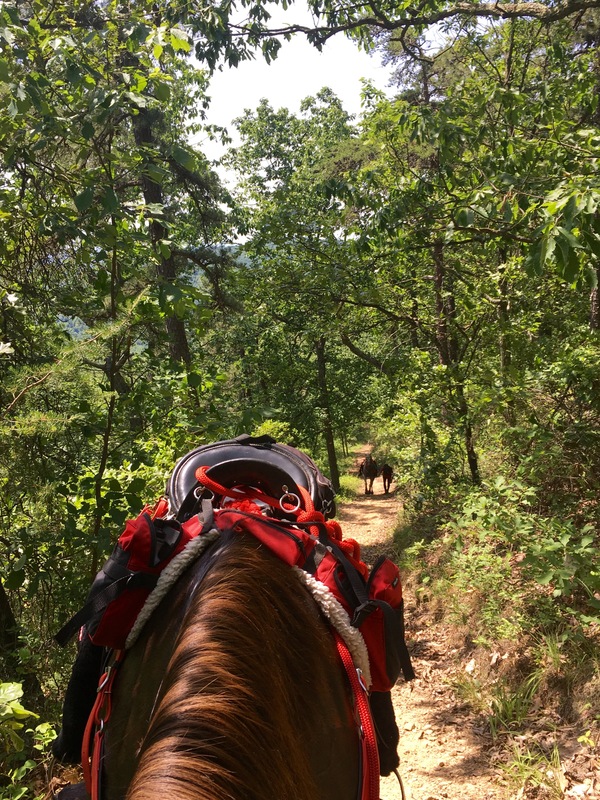 I occasionally had to ask to pass a friend and move on down rocky slopes that we had a faster groove and if someone is flying along at a trot Khaleesi just doesn’t have efficiently I refuse to try to keep up (thankfully she is ok with that). Those decisions made a huge difference for us. Never ever tarry. Every second adds up to precious minutes. Some riders crossed literally in the seconds that meant complete or overtime. When to get off. 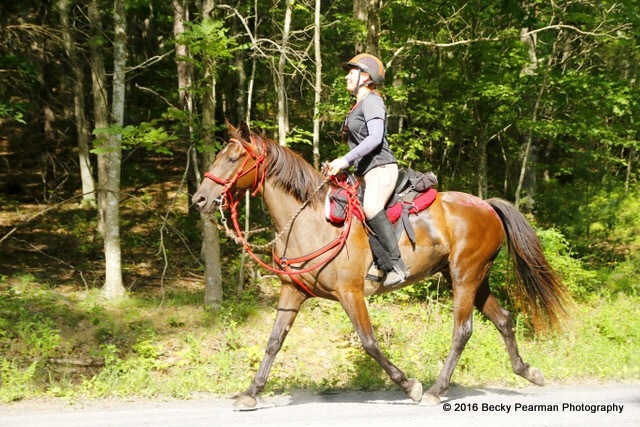 I rode with a nice and experienced rider at Big South Fork last fall there aren’t a ton of hills there but one or two that are steep. She cantered Leroy up the hill until he slowed on his own and she immediately jumped off. 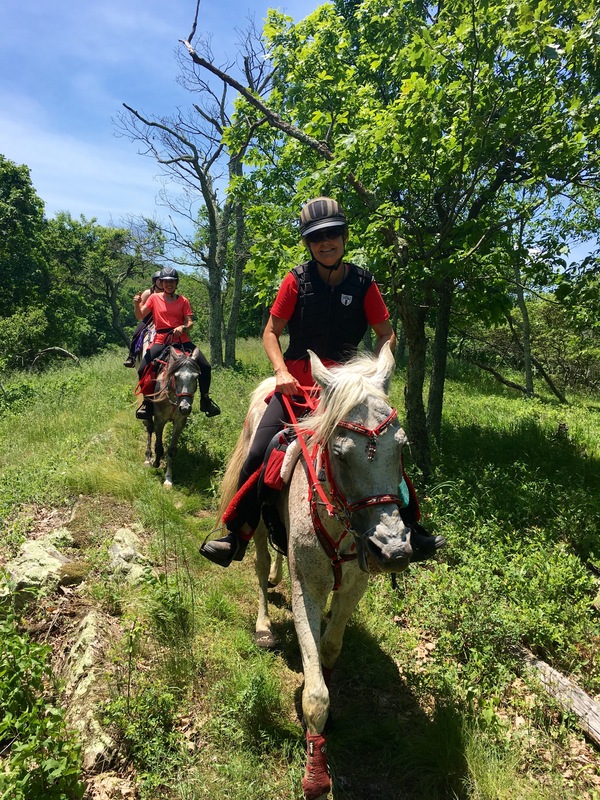 I asked her if everything was ok and she said of course: it’s easier for them to canter up the hill until they are tired. Then they must walk. But if we are walking, then I walk too. It saves my horse. When we hit the start of the massive mountain climb I was still with Pascale and I heard that riders voice in my head as I jumped off and started hiking. Pascale did the same. It was two brutal miles of hiking straight up the mountain in the mid-day heat. After getting back on at the top we passed at least a few riders whose horses were still struggling even after it had leveled out. Eat before you’re hungry and drink before you’re thirsty (from Karen Chaton). At the Biltmore I learned this endurance rider cannot live on PB&J alone. Easy to pack no need for refrigeration and can be smashed- I couldn’t eat another one at some point in the day. For this ride I packed a mini-soft cooler to be able to bring hydrating and sweet watermelon, a lunchmeat wrap, hopefully colder water for later in the day… I had salt and vinegar chips (I hear salty is also good for you), I had snack mixes and dried coconut. I ate at every vet check and though at home I can eat while riding (a granola bar etc) I find I’m too focused at a ride to eat in between loops so I just make sure I eat well at every vet check. I drank less water early in the morning but went through almost all my drinks each loop after the first. I mix it up with one straight water and one gatorade, vitamin water or other coconut or tea based hydrating sports drink (I cut them with water because they are too much for me straight). If I don’t ‘feel’ thirsty at least the flavored drinks are interesting enough to take a drink here and there. 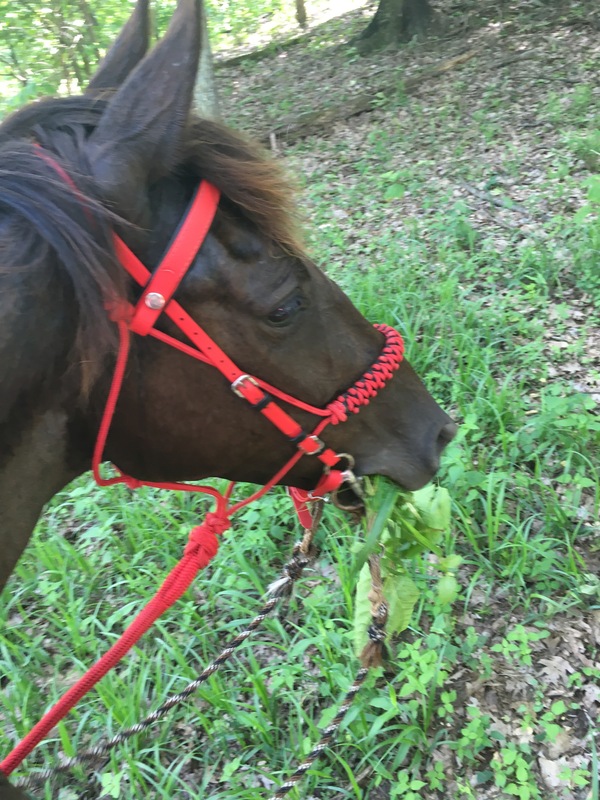 Get your horse to eat on trail. I don’t know if we have this completely figured out but my rule is grab any bite you can without interfering with our pace. If we are stuck walking (like we were some of the roughest sections) then grab a mouthful here and there. If I saw a nice patch of grass I was able to walk her right into it and she would dig in. Then we’d keep on to the next spot. We didn’t have any time to waste but keeping something in her gut was also important. It’s a fine line. We did ok with this. #8 things I learned about heat riding. Sponge. Most riders carry one but earlier this season it really wasn’t necessary for us so I hadn’t. This spring I saw a sponge for sale when ordering my cooling sleeves and threw one in the order again without a lot of thought. 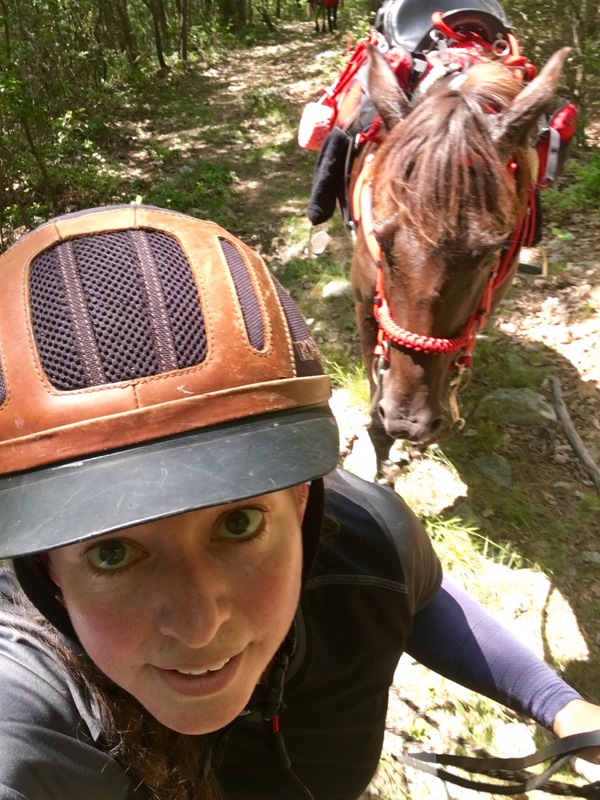 I used it at every water stop to help cool my horse and sometimes sponged my own arms to help my cooling sleeves **product placement note: I picked up the Kerrits cooling sleeves recently and love them. They definitely make my arms cooler and are better than sunscreen. Highly recommended. Electolyte. I have read strong riders in the West who quote research that electrolying does not actually help. I’ve wondered but I will continue with electrolyted on races and harder training rides. I do not however e-lyte before the ride (when she hasn’t begun sweating) right now and I don’t do it the night before. My understanding is that until they lose the salts in sweat the balance is right and they don’t load extra. I also don’t want to annoy her the night before and possibly affect her eating and drinking. I doubled up on my electrolytes during this hot race however. We use enduromax and I mix with yogurt, molasses and some applesauce. She seems to like it enough not to fight me. 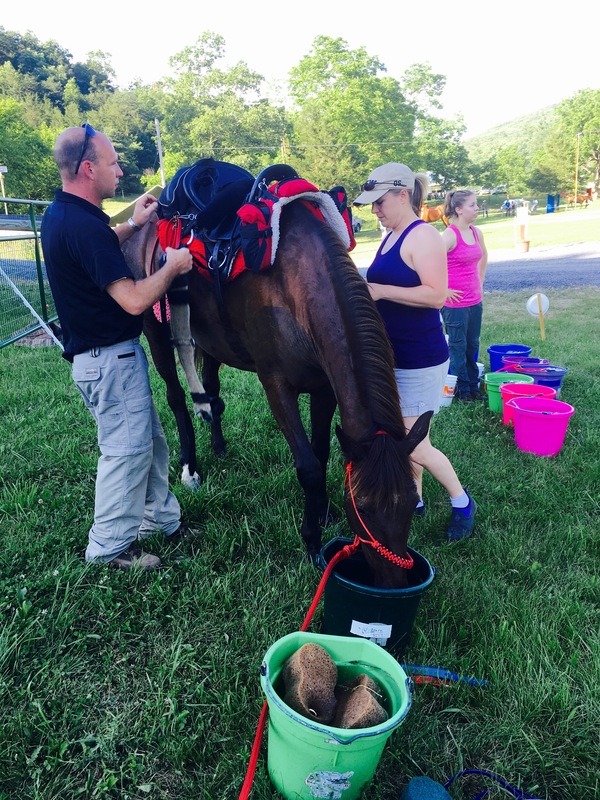 Ice and cool your horse… more. Special thanks to Kate Lawrence who taught me about the importance of core temperature. At the crew-less Laurel Run check I looked for some help (I didn’t send a crew bag and needed a sweat scraper). Kate who was a volunteer saw me and took me on for the entire hold and was one of the many things that went right for me that enabled us to finish strong. Before we could pulse we went into the shade and sponged ice water all over Khaleesi. Once we got her pulse time (just a few minutes) she told me not to vet yet. We had 30 minutes technically to make it over to the vet and just because her outside temperature had cooled and her heart rate was “legal” didn’t mean she was ideal. 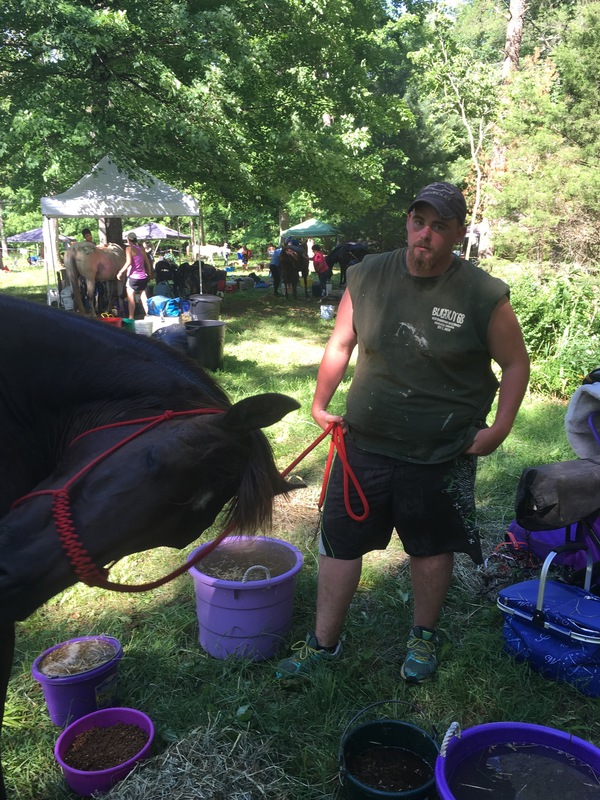 It was so hot that horses were pulsing in the pulse box then walking up in the sun to vet and their CRIs were going back up into the 80s and vets were having to hold rider cards to be sure the horse was fit to continue. She didn’t want that to happen to us so we continued to ice down K for another 2-3 minutes past when she’d pulsed. Then she sent me around in the shade (not directly) to the vet area and told me to wait in the shade for the vet. But no. Dr. Bob said she was spot on and looked great. 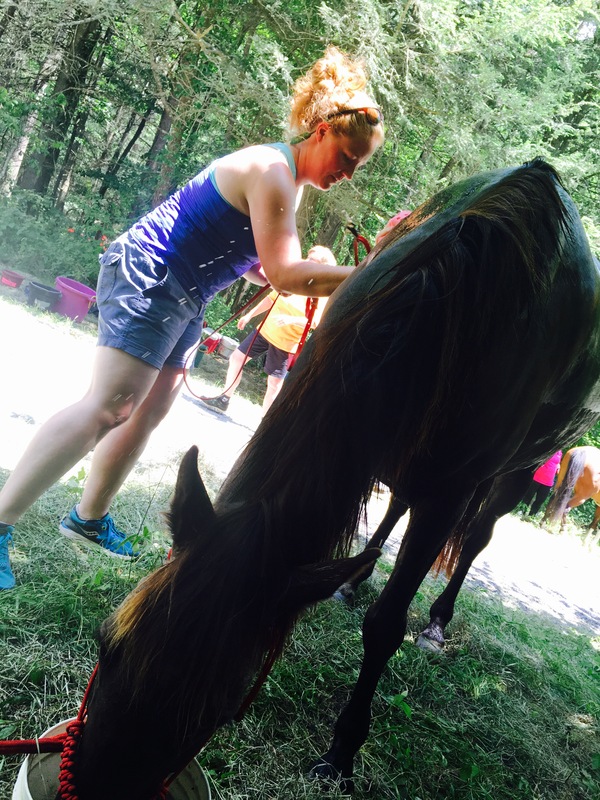 Her CRI was solid at 64 and we met Kate at our saddle where she had a bucket for me to sit down, a sandwich, a water and a cold gatorade, hay and feed for Khaleesi and more ice water that she continued to sponge onto my horse in the shade for 15 more minutes. 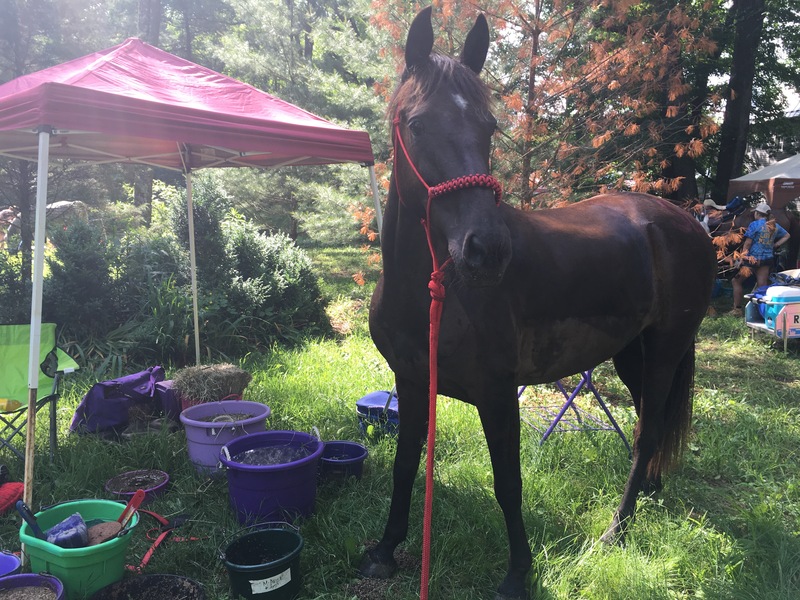 I would not have thought to do this but what she did for me was get down into the core temperature of my horse on this 95F afternoon so that when we left Laurel Run we were back at 100%. 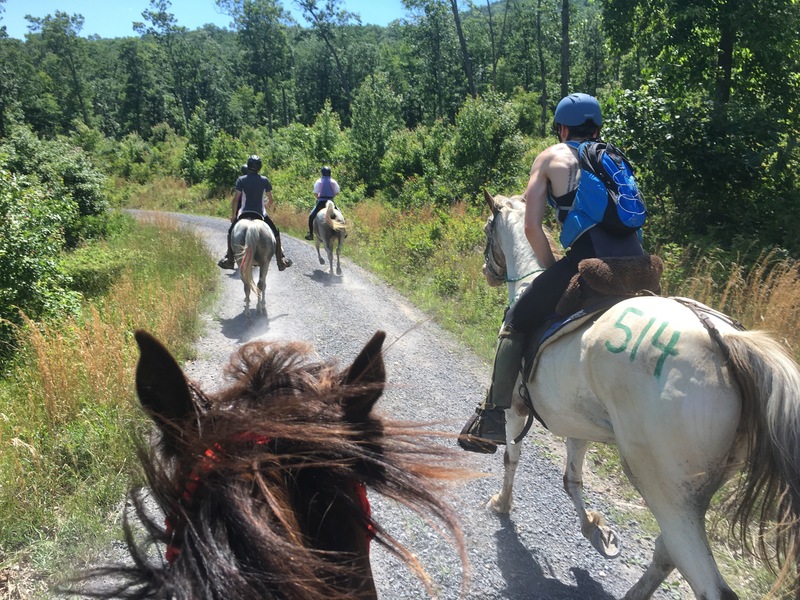 Horses who just did what they needed to meet criteria may have been heading back on the trail only 50% cooled down and we still had 20 hot miles to go. We were fresh to run, and that’s what we had to do for the next 12 miles. We were now on relentless gravel roads that would take us down back into Bird Haven. Still, the relentless gravel was welcome compared to the boulders and rocks and the ridge climb that got us up there. As we left the vet check Kate reminded me to keep moving at all costs- the breeze will help and never let her stop in sunny areas. If you have to walk- only do so in the shade. Because of Kate- we never had to walk- not for the next 12 miles. But we did pass a rider or two who wasn’t so lucky. The third loop was our fastest overall with an average speed of only 6.7mph. We made it into the last Bird Haven to find Ricky and Amy ready for us. They have been a godsend to run into and are wonderful friends. 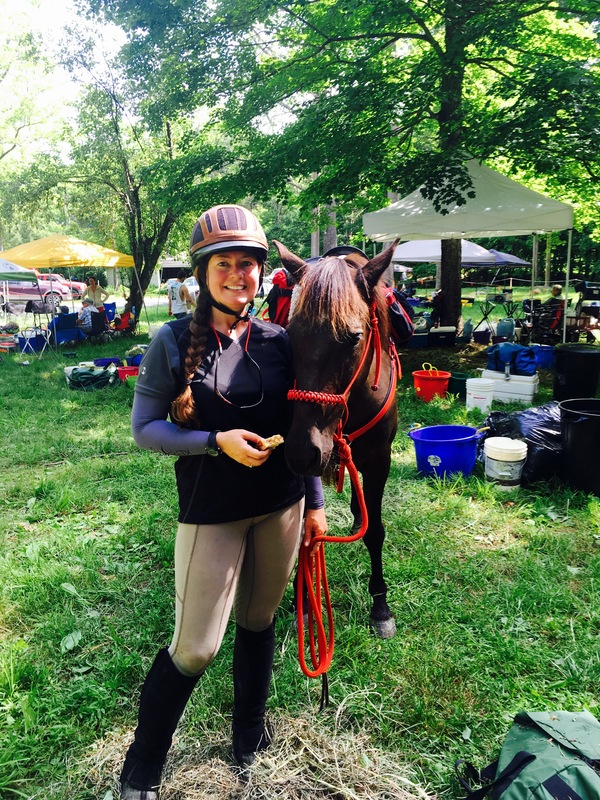 For someone so young Amy has many years in the sport and knows every hack possible. 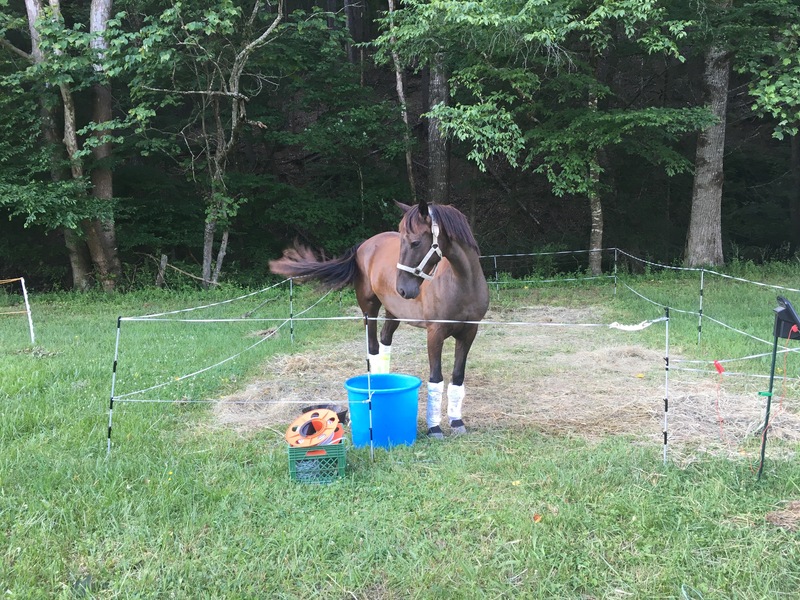 She also learns quickly and after Biltmore when my 3-way rigging had her wondering what was going on- she resaddled Khaleesi perfectly while I was in the bathroom like she’d been doing it all her life. 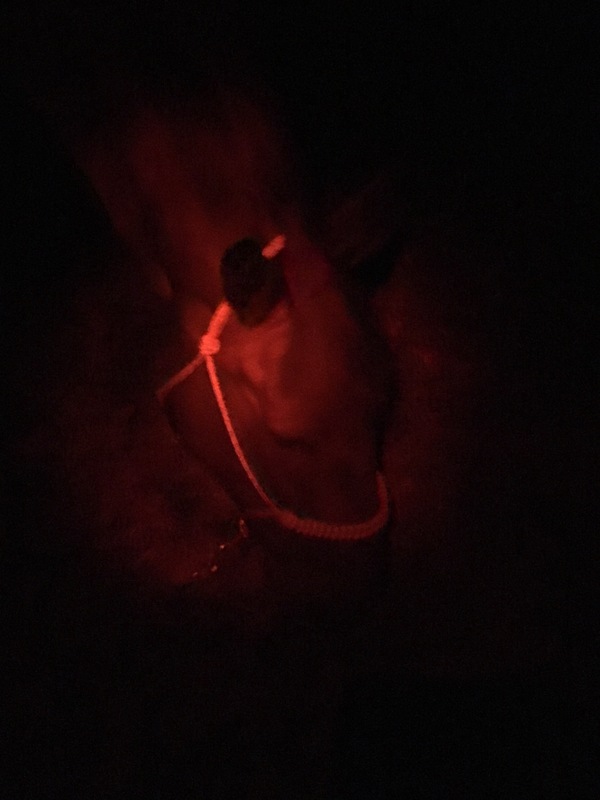 As I’m still dismounting they have her saddle coming off practically underneath me and are dousing her with cool water and have the heart rate monitor started to see how long until we can pulse. Thankfully K does drop pulse “like a stone” and it never takes more than a minute to walk her over to the P&R box. We went through Vet Check 3 with no trouble and an even better recovery than VC2 (60/56). She had all As at this point in the ride except her cap refill (hydration in the gums) was a B-. She was not showing any other signs of dehydration (skin tenting was an A) and I knew she was drinking well so Dr. Art suggested because of the heat the blood goes to the capillaries in the gums last and it’s more likely a sign of her being hot than dehydrated. Her gut sounds were +/- on each side so considering she was trying to eat everything in sight (a good sign) she was sent on her way. Amy and Ricky took her, did some more sponging as I sat down to eat my snacks and refilled cool water into my pack. This hold is only 30 minutes before the last 6 miles into camp so there isn’t much time to relax. She looked fantastic. 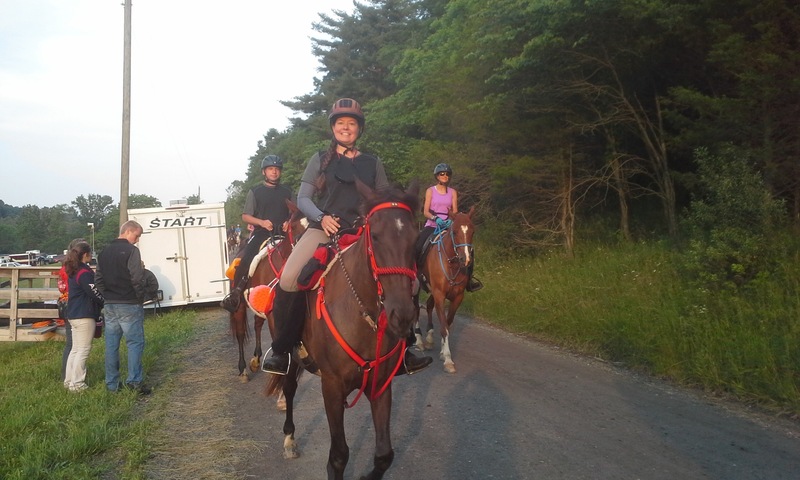 The benefit of an out and back ride is that she was more familiar with the area and was heading home to camp since Laurel Run so she didn’t have that mental crash where she ground to a halt like at Biltmore. She’d also done 55 before so maybe wasn’t so shocked to still be out at mile 44. Leaving the vet checks is always hardest for us. She pulls the turn around and wants to go back (even at Laurel Run!! when I was trying to head her “home” she wanted to go back and visit with Kate who had cool water and never ending feed bowl!). She tried to circle a few times but after a little discussion we headed out and she got with the program. The last 6 miles is not hard but has rocky sections that slowed her down. We had plenty of time (90 minutes to complete what we should do in an hour or less) so if she asked to slow in the rocks I let her even though part of my brain was also headed home and wanted her to keep flying through. I could just imagine getting this far and then a stone bruise putting her off at the final check and getting pulled at the finish line (how disappointing that would be!). So since finishing at 6:15 or 6:44 is really the same (complete) I tried to use my head instead of my fast racing heart. We still passed 6 riders in that last section for various reasons to cross the finish line at 6:12pm. I was incredibly proud of my horse. At that moment all the tiny details that went right for us to bring us strong across the finish when so many weren’t so lucky flashed through my mind. Every minute we didn’t wait at a water crossing she wasn’t interested in… every time we asked to pass a friend who wasn’t moving through the rocks as well… and the relationship we had to leave new buddies behind for various reasons and move out in front or alone… everything added up to get us through. It’s humbling and also exciting when things go right. You prepare the best you can and then you hope. I know one day we will not be so fortunate, and I hope on the day we can’t start due to a heel bruise or the day we have to pull for some reason we jump back in and give as much back to those in the same position this weekend who gave to us. But for today we celebrate. We conquered the (half) Beast of the East on our first try on one of the tougher days in recent years. Two days later my horse looks good. She is a little slow and a little stiff maybe, but after poulticing and wrapping her joints are in better shape (less puffy and fluid) than after Biltmore. Her back is perfect- I asked the vets to really check (not just the routine spine press) and not a twitch or a flinch. She is loving the wide tree Phoneix Rising saddle and after that 50 miles I can say it’s her saddle for now. And best of all, we are still friends. I felt pretty good though tired- better than I’d felt at Biltmore. The next day was ok once I got moving but I crashed hard in the afternoon like I had a hangover and slept from 5pm-7am. Monday I felt good enough to help put up 400 bales of hay and unload to some friends. I want to be sure to thank those who all made the day a success. Dianne Conolly and all the OD board and volunteers. 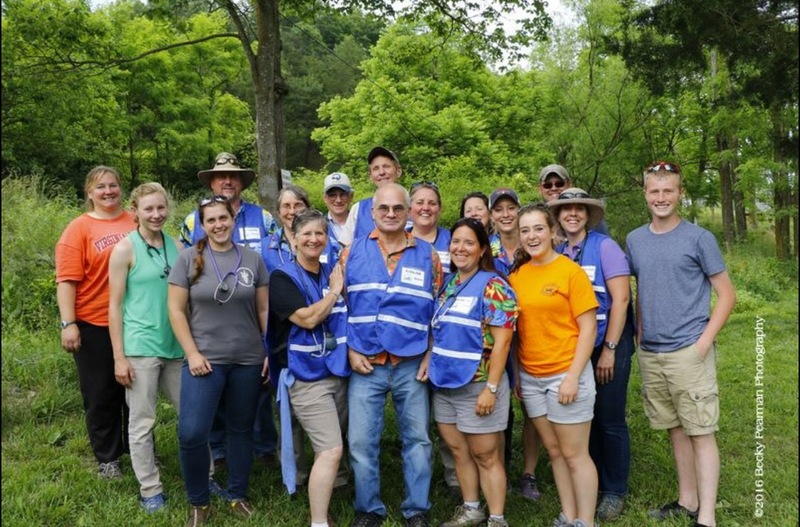 The entire vet staff who support and encourage us and help us care for our equine partners. Lynne Gilbert my ‘official’ mentor as well as Ricky and Amy Stone crew extraordinaire! Kate Lawrence and Nathan Payne for the extra help when I needed a hand. the power line hill in the first loop. Nothing compared to the falls hill in the second loop. I heard riders comment that the OD is about survival and the right to say you made it through than lretty trail and views… here I respectfully disagree! GO TEAM!!!!! Such an intense ride and you guys came through awesome. It must feel so good. The pictures by Becky are stunning! What breed is your horse and do you use regular shoes? I feel like I’m a odd ball with using regular shoes on my TBxWB mare. We are going to switch to plastic shoes soon for more tread. Khaleesi has 1/4 of each: saddlebred, racking horse, TN walker, Arabian. My farrier is pretty traditional but he is a fan of what works. I use metal shoes and he does two side clips. We have tough terrain here and I have only lost one shoe in the two seasons he’s shoed this horse. (And maybe 1 or 2 in the years he’s shoed my older MFT mare). I am interested in rubber but I will not make that change until this season is over. We do not use glue ons because he says the glue deteriorates the hoof wall over time much worse than nail holes that grow out. I give her about 4 months over winter with no shoes and I use renegades then. We used front pads at the OD and Biltmore. She has good feet but they grow slowly and she is ‘sensitive’ to lots of rocks unlike my MFT who could go barefoot if it didn’t wear her feet down over time. Oh, and good read by the way! I read it all while drinking my morning coffee. I’m preparing for the possibility of doing my first 50 in September. We are doing our first back to back rides this weekend; 25 on Saturday and 30 on Sunday. 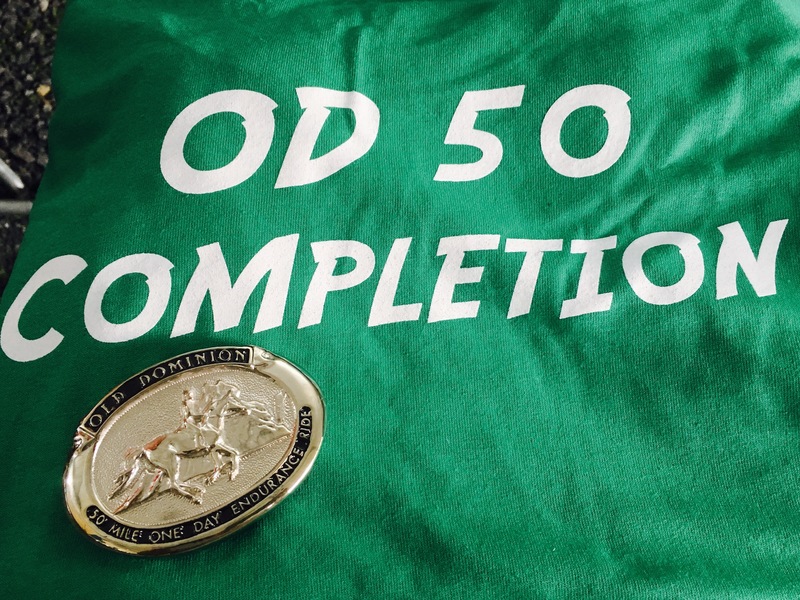 Congratulations on your OD 50! My wife and I started with LD (Learning Distance) in VT last year. We have been following your blog and leveraging your experience as we learn too. I enjoy the amount of detail you add and your writing is family friendly, so we share the posts with our 12 year old son and 10 year old daughter. In August, we plan for both of them to enter their first LD. Good luck on the journey to 100. Maybe we will meet you at a ride one day (we live in Connecticut). I’m so glad my posts help share information… I hope we do cross paths- how fun that the family is all involved! I just read your blog because there was a link to it on ridecamp. 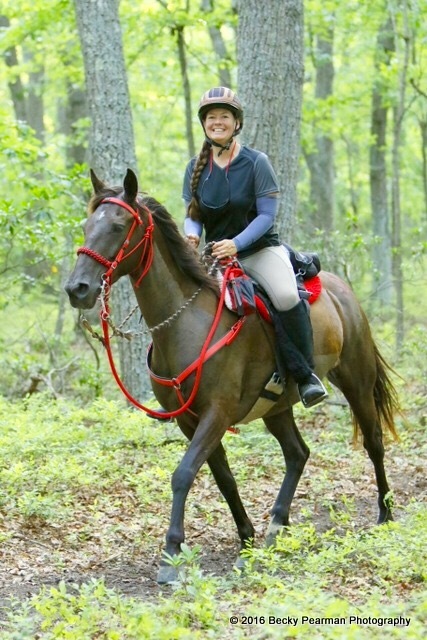 I’m a somewhat experienced endurance rider who now lives in NM (I lived in AR when I started the sport) and I’ve been serving as a “designated AERC mentor” for the last few years. Just this morning, I received an email from AERC asking me to respond to a survey and contribute to an article that they’re planning for the August EN magazine. The comments that I supplied to them pretty much fall-in-line with your observations. Your comments regarding “finding the right mentor” were so right-on-spot! 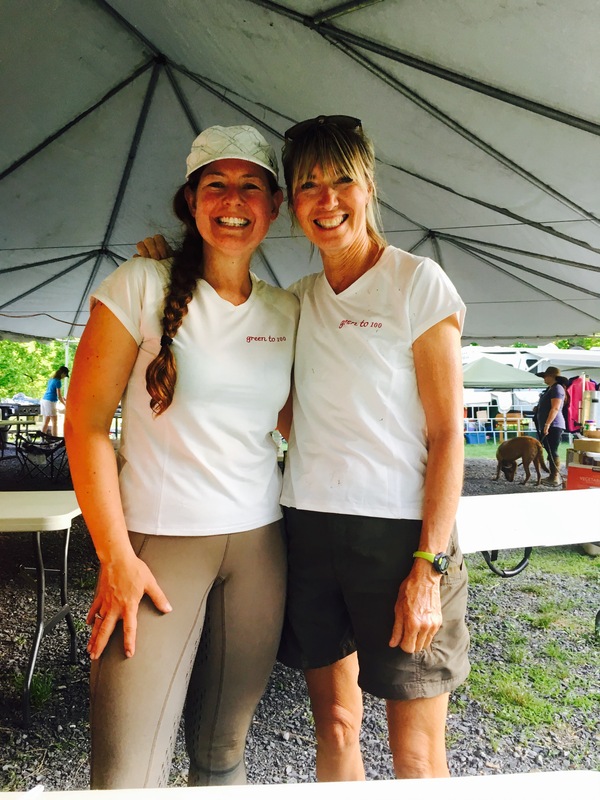 (And I rode a couple of 100 milers along-the-same-trail as Lynne Gilbert back in the early ’90s, so I know what an awesome person she is). My understanding is that she’s going to be at the Shamrock Ride in WY over the 4th of July weekend: I’m looking forward to re-introducing myself to her there. I am also very much impressed by the fact that you realize that supporting-those-who-support-the-sport is important. It is a very rewarding aspect and you’ll reap even more benefits as you learn from ride management assistance / crewing experiences. I rode the OD 100 in 1992 (I think… it was my 2nd attempt at 100 miles and I finished it in something like 23 hours 40 minutes). I attempted Tevis in 2012 and was pulled for a lameness issue at 64 miles. I finished Tevis in 19th place in 2015. 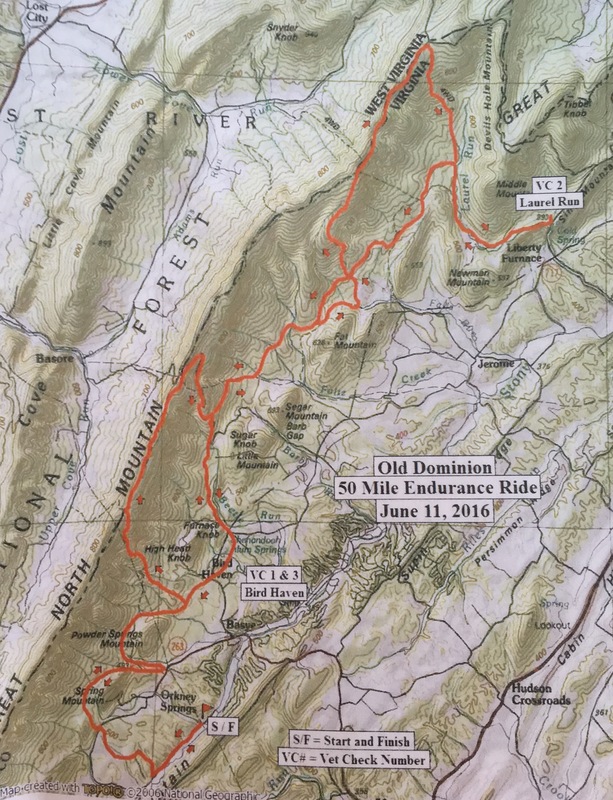 Even though my lack-of-experience is prob’ly a large reason that OD seemed so much harder than Tevis, I still believe that the heat/humidity and the fact that you’re not slowly working-your-way-down from an elevation of about 8000 feet to 300 feet (like on the Tevis trail) truly does make the OD trail more difficult. Congratulations on your successful ride at the OD. You did an awesome job and I believe you are laying the groundwork for a very successful endurance career. I hope to meet you on trial someday! 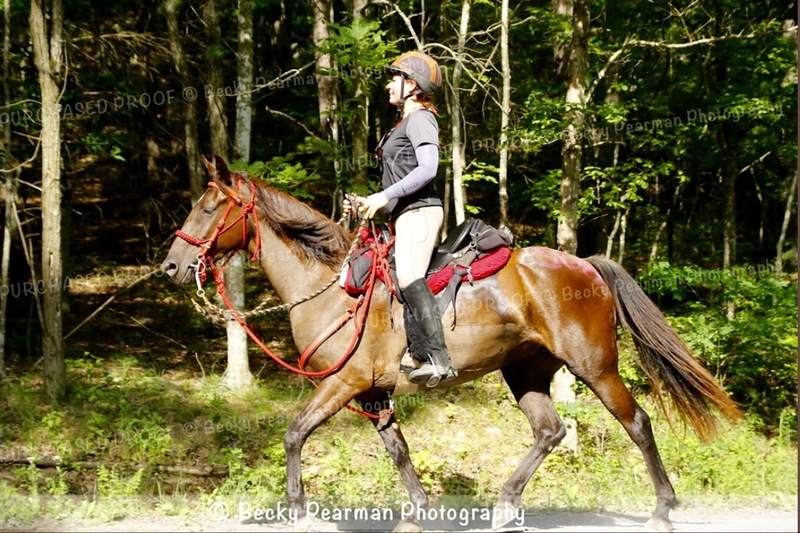 Yes, Lynne is riding Tevis this year and she is headed to shamrock on the way. I have been enjoying my journey and love to write- process as I go and it always makes me happy that someone else out there might enjoy my thoughts and stories and what I’m learning. My green horse is getting less green each month… We are on the Long slow foundation plan so won’t be at our hundred goal until 2018 at the soonest but I can hardly wait! Awesome ride story. Congrats on the finish. Congrats on your completion on that miserable hot day! Agree so much with all of your points throughout the post. 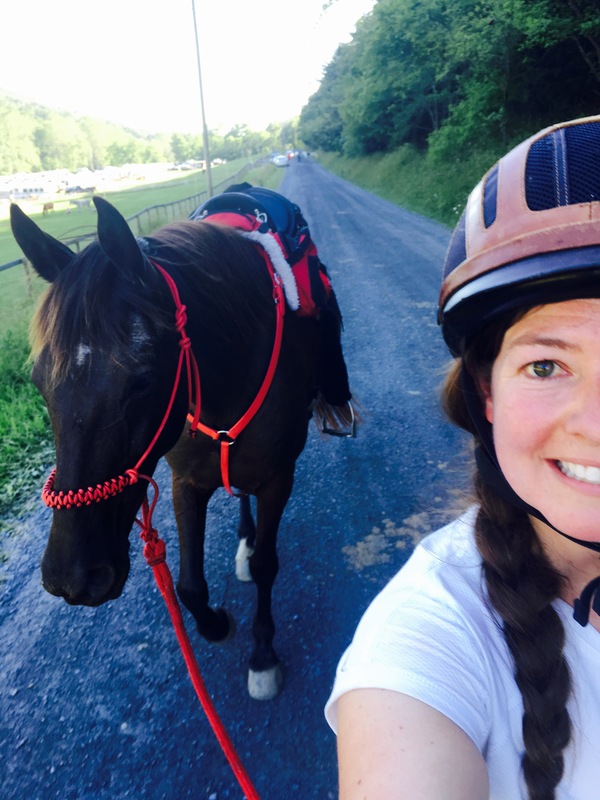 =) My mare and I completed the OD100 this year (our first 100) and I feel much the same re: what things made us successful! Ricky and Amy are WONDERFUL people! Endurance folks are often so so terrific.